More than 30 million people in the United States have diabetes and are at risk for serious foot complications as a result. 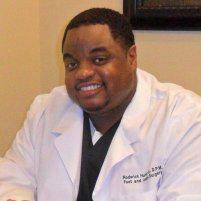 At his podiatry practice in Plano, Texas, Roderick Hunter Jr., DPM, AACFAS, offers comprehensive foot care for patients with diabetes to prevent medical complications, including the need for amputation. Routine checkups with Dr. Hunter and his friendly, compassionate medical team can help ensure the long-term health of your feet if your diabetic. Schedule your initial exam today by calling the office or using the online booking feature. Diabetes is a chronic condition that involves dysfunction in the way your body processes sugar from the foods you eat. The disease can cause a number of health complications, many of which directly affect the health of your feet. Even small foot injuries can develop into a major medical complication when you have diabetes. These issues can result in permanent foot damage that eventually requires amputation of the affected foot. To prevent limb loss and other health complications, you need to have regular foot checkups with Dr. Hunter. What’s involved in a diabetic foot exam? During your appointment, Dr. Hunter reviews your medical history and discusses any changes you’ve noticed in your feet since your last visit. He performs a physical examination of your feet and ankles, looking for signs of infection, skin damage, pain, or loss of sensation. Dr. Hunter may also conduct testing to check the health and functionality of your feet. These tests may include a pinprick to the bottom of your foot to determine your level of sensitivity. He may also administer a vibration test, placing a vibrating tuning fork on different areas of your foot to detect nerve damage. Another test for nerve functionality involves an ankle reflex test. Dr. Hunter taps on the Achilles tendon that travels down the back of your ankle to determine if you have strong reflexes or if there are signs of neuropathy. How should I care for my feet at home? You should keep your feet dry and clean at all times and change socks regularly. Avoid walking barefoot to prevent injuries. Preventing diabetic foot damage also requires that you keep your diabetes well-controlled through diet and insulin therapy. You should check your blood sugar several times a day and seek medical assistance if your sugar levels are difficult to control. Schedule a diabetic foot exam with Dr. Hunter using online booking or by calling his Plano office directly.